In early September, Janus Boshoff visited us from Johannesburg to share with us his encyclopedic knowledge of alternative photographic processes. We focused on the wet collodian process. This was invented in the 1850’s as a cost effective alternative to daguerreotype and salted paper processes. This was the process in which Roger Fenton photographed the Crimean war and Matthew Brady documented the American Civil War. The quality of these images is astounding and artists such as Sally Mann practice the process today. 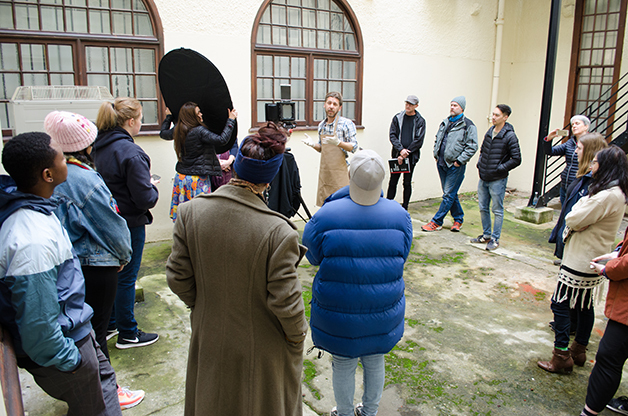 The demonstration involved students from a variety of disciplines including photography, print and sculpture. Janus was able to take students through the whole process from cleaning the plate, coating in the darkroom, shooting and then developing the print. It was magical. The workshops involved staff and Postgraduate students, including Sitaara Stodel, Stephen Inggs, Vanessa Cowling, Jean Brundrit, Svea Josephy and Garth Meyer. Here we were taken through the details of the process and shown how to prepare, cut glass, clean glass, pour collodian, shoot, develop, fix, wash and varnish our own plates. It is a slow process but we took some astounding pictures and learned a lot. We hope, after practice, that we will be able to pass on our skills to students. Thanks so much to Janus for making the journey to Cape Town and for his patience and knowledge in passing on this skill to us.